Eidos has dispatched a stunning new render of doppelganger Lara Croft against the backdrop of a burning Croft Manor. 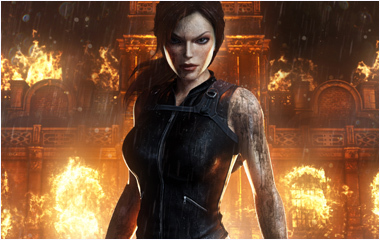 The doppelganger became one of Lara Croft's arched adversaries in Tomb Raider Underworld. Tomb Raider Underworld marks the first game in this flagship series that is designed specifically for next generation consoles. Lara Croft uncovers proof of the existence of the mythical hammer of the Norse God Thor, a weapon rumored to have the power to smash mountains into valleys and destroy the Gods themselves. Setting an epic journey around the globe in motion, Lara visits the ruins of ancient civilizations, collecting clues that lead her to a forgotten power that could lay waste to all civilization.